Fiona was the hometown hero as she paddled clear from world number one Annabel Anderson and seasoned veteran Angie Jackson, while the rising star and definite name-to-watch Annie Reickert finished third. Annie was particularly impressive, showing maturity well beyond her years to claim a top finish against one of the most competitive women’s fields we’ve ever seen. Her team mate fellow youngster Hannah Hill was another to impress, with the Hood River native securing a top five finish for the home team. Annabel overcame a slow start in the opening run to finish second, a result she repeated in the second run after seeing off a strong challenge from Angie — their see-sawing duel was one of the highlights of the day. But it was certainly Fiona’s day, with the world number two using her immense local knowledge and sublime paddling skills to record a mammoth victory. Fiona was almost out of sight at the finish line, winning the first run by over three minutes and enjoying a similar gap on the second leg to produce an almost-six minute lead on the overall time sheet. 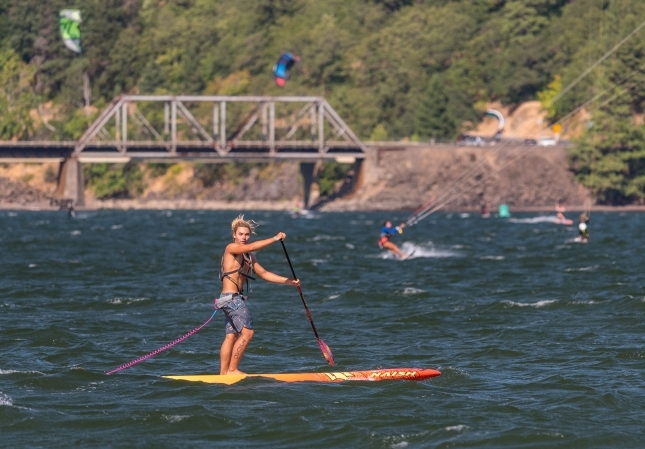 In the men’s Double Down, Bernd was in a league of his own as he weaved his way across the Columbia River Gorge from start to finish, reeling in the other contenders and eventually paddling clear to win both runs by about a minute. 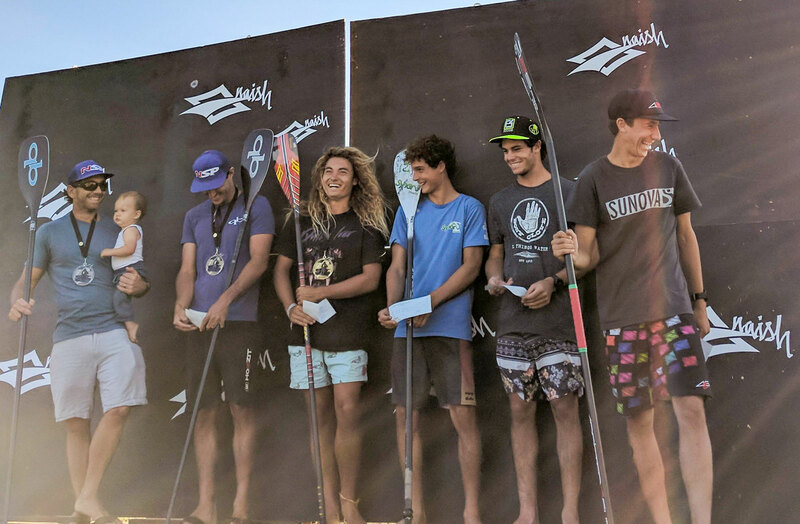 Bernd’s victory today sees the Naish team rider go one spot better than he did 12 months ago, which is precisely when he announced himself as a genuine contender on the racing scene. A string of big results in Hawaii over the past few months helped build Bernd’s reputation as one of the finest downwind paddlers on the planet, but today’s result will absolutely cement his membership in the top tier of the sport. Every top paddler I spoke with post-race said the same thing: Bernd was untouchable out there today. Aussie Travis Grant and New Caledonian Titouan Puyo showed that racing experience is hard to match, finishing strong in the second run to secure a double podium finish for teams Quickblade and NSP. These guys showed true class out there today, relying on a combination of skill, strategy and simple patience to overcome the intense challenge thrown at them early on by the youth brigade. The result continues an extraordinary season for “T1 & T2” following their 1-2 finish at the Carolina Cup and their similar achievement at Molokai last month, where Trav took the title and Titou was third. Trav’s runner-up finish today will see him leapfrog Michael Booth when the world rankings are updated on Monday morning, while both he and Titou have a shot of finishing the season ranked number one as we head towards the Pacific Paddle Games in late September. Speaking of Titou: his young protégés from New Cal, 15-year-old Noic Garioud and 16-year-old Clément Colmas, were one of the big stories today. These kids turned a LOT of heads and showed they’re going to be very hard to beat in another year or two. We had a feeling that Clement could do something special after his runner-up effort at the King of the Cut in Western Australia late last year, but it was actually Noic who attacked first this morning. Noic, the younger of the two, was leading the first downwinder for a good 10-15 minutes until Bernd, Mo and Clement finally caught up and eventually pulled clear. After the second run was complete, Clement was only six seconds behind Titou on the overall time sheet, while Noic secured a podium finish ahead of several big names. These kids are the future, and the future has well and truly arrived. The result gives New Caledonia three of the top six spots, which is an extraordinary accomplishment considering this semi-autonomous French Pacific island has a population of just 278,000. Mo Freitas showed glimpses of brilliance and looked set to take out the first run before being reeled in by Bernd in the final couple of miles. After a shaky start in the opener, Frenchman Martin Letourneur finished like a rocket to claim 5th place in the second run and 7th overall. Lincoln Dews was up there early but faded late to finish 8th, though he still showed signs of why he’s considered a threat at every race he enters these days. It wasn’t a great day at the office for defending champ Connor Baxter, with the world number one fading badly to almost miss a spot in the top 10. The under-rated warrior Steeve Teihotaata led the charge of the Tahitian army today, quickly adapting to the “local knowledge” conditions of the Gorge to finish top 10 while his compatriots Georges Cronsteadt, Enzo Bennett and Rete Ebb were all top 15 as well. Once again Tahiti showed why it’s so feared and respected in the paddling world. In fact, if you combine Tahiti, New Caledonia and France, which are all French-speaking (and all technically part of France anyway), the Frenchies claimed more than half of the top spots, incredibly filling 8 of the top 15 positions in one of the most-competitive races our sport has ever seen. 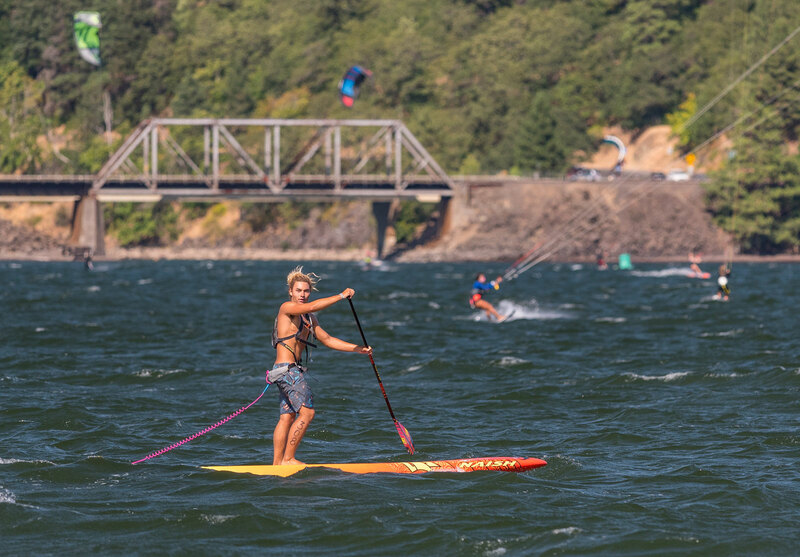 One of the clear themes at this year’s Gorge Paddle Challenge has been the youth, and that theme continued during the exhibition foil race early this morning where the Spencer Brothers, Finn and Jeffrey, upset the superstar pioneer of the foiling division, Kai Lenny. But anyway that’s a wrap for today. 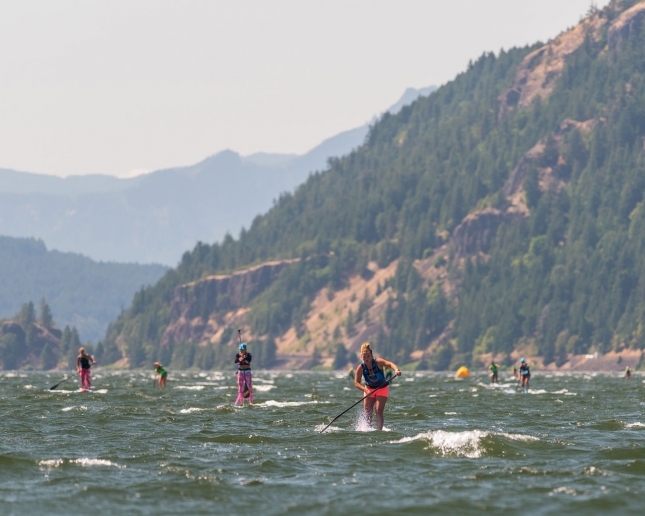 You can watch a full replay of our Gorge Paddle Challenge live stream, and also enjoy this great little highlights reel from the Quickblade crew below. Big thanks to all the organisers, volunteers, sponsors, supporters and paddlers that made it such a fun day here in Hood River. And thank you to everyone that tuned in on our Quickblade Live Stream: see you back out there for Sunday afternoon’s live stream of the Super Lap course race. You can find the results from all races and divisions over on Paddle Guru. We’ll continue posting them here later tonight.